Islamic Research Institute (IRI) is publishing three research journals titled 'Fikro-Nazar', 'Islamic Studies' and 'Al-Dirassat Al-Islamyya' in Urdu, English and Arabic languages respectively. Fikr-o Nazar is a leading Pakistani refereed research journal published by Islamic Research Institute (IRI) since July-August 1963 in Urdu language. It is a quarterly journal dedicated to provide analysis and commentary on issues related to Islam and Muslim Ummah. It brings together many of today's most innovative and distinguished thinkers, making their research available not just to specialists but also to a wider audience of globally concerned readers in Urdu language. Fikr-o Nazar covers all areas of Islamic Studies and enjoys a good international reputation among scholarly Journals in Urdu. From time to time the journal has brought out special issues on different themes. Its landmark publications have been received well by both scholars and general readers. The contributors to Fikr-o Nazar include some of the most eminent scholars and thinkers of South Asia. Fikr-o Nazar is an interdisciplinary journal of peer-reviewed research and informed opinion on the various issues of Islamic Thought. Its readers include scholars, practitioners, religious leaders, policy makers, journalists and commoners. Intellectually rigorous yet accessible and practical, it provides an influential outlet for original scholarship in social sciences, law and humanities, as well as a lively forum for research from Islamic perspectives. مجلة الدراسات الإسلامية تصدر منذ عام 1965م من مجمع البحوث الإسلامية. وهي فصلية محكّمة تعنى بمناقشة قضايا تتصل بالعلوم الإسلامية وكافة فروعها ومجالاتها (من التفسير والحديث والفقه والكلام والفلسفة والتصوف وعلوم اللغة والبلاغة والتاريخ والسيرة والفكر الإسلامي وما إلى ذلك) وفي نفس الوقت تسعى المجلة لعرض بحوث تحتوي على أفكار علمية وآراء أصيلة حول قضايا فكرية وعلمية واجتماعية وحضارية معاصرة وحلولها المستمدة من القرآن والسنة والتراث الإسلامي الثري كما تهتم المجلة بالدراسات المركزة على التعريف بالتراث الإسلامي الغني من خلال تحقيق المؤلفات والرسائل والنصوص النادرة والمخطوطات إلخ. والمجلة قد نالت اهتمام الأساتذة الباحثين من شتى أنحاء العالم الإسلامي فحظيت باسهاماتهم العلمية القيمة على مدى 47 سنة من عمر هذه المجلة وكذلك لقيت المجلة استقبالا حافلا لدى الأوساط الأكاديمية في العالم الإسلامي بصورة عامة فقد أصبحت هي مجلة معترف بها في باكستان وخارجها. Al−Dirasat Al−Islamiyyah is a leading Pakistani refereed research Journal published by Islamic Research (IRI) since 1965 in Arabic Language. It is a quarterly Journal dedicated to provide original research articles in Islamic studies as well as analysis and commentary on issues related to Islam and Muslim Ummah. 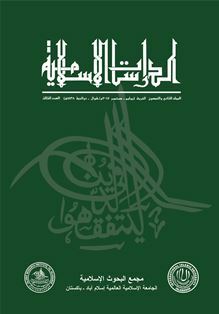 This Journal brings together many of today’s distinguished scholars and thinkers, making their research and commentaries available not only to specialists but to a wider audience of readers in Arabic Language.